My son Asher turned two this month. I know. I KNOW. It seems like only yesterday I was writing a blog announcement and posting pictures of him in a wee Hershey’s kisses hat. Like every parent always says, the past few years have sped by and I can’t believe I now have a toddler who runs and sings and eats us under the table and tells me over and over that he’s a big kid. This parenting stuff is heartbreaking and wonderful. Last year we threw him a big Very Hungry Caterpillar birthday party, and it was a blast! (You can see the 3-tiered Caterpillar cake I made here, and read more about the party details here.) I loved everything about it–the park setting, the big gathering of our friends from all over the city, and the use of a literary theme. We decided to recreate the magic this year, and threw him a Where the Wild Things Are party. I have a big post coming up with all the party details, but before that happens, we have to talk about the most important thing: the cake! This beauty is nine layers of chocolate cake, sandwiching chocolate buttercream, salted caramel buttercream, and salted caramel filling. I wanted to evoke the feeling and imagery of the book without being super literal and sculpting mini Wild Things out of fondant or something. 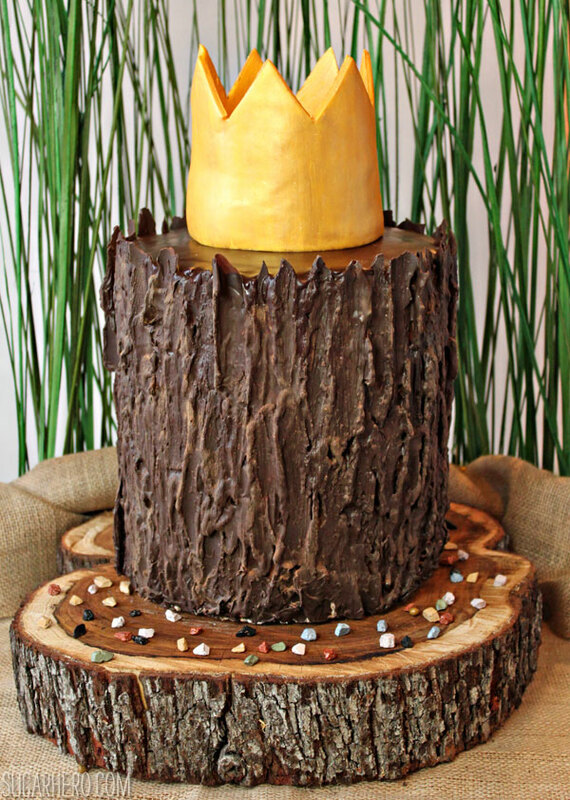 I decided to make my cake look like a tree stump, complete with rough chocolate bark, and topped it with a gleaming gold fondant crown. I wouldn’t necessarily say that any type of layered cake is easy, but I do think that this type of decoration is easier and faster than traditional fondant-covered layer cakes. It’s meant to look rough and imperfect, so the texture of the cake can go a long way toward hiding any mistakes. 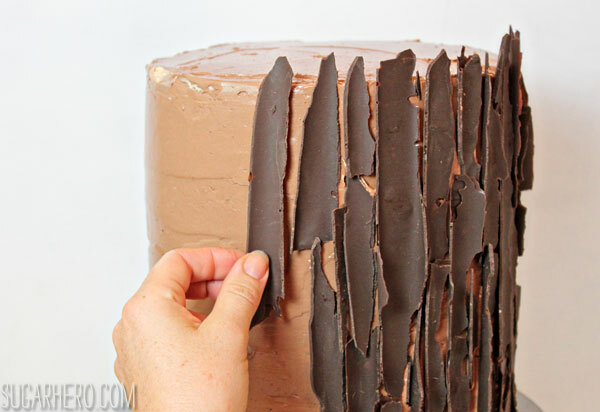 The tree bark effect is made by pressing long strips of curled chocolate into the buttercream, then painting over it with more melted chocolate. The protruding curls, uneven brush strokes, and globs of chocolate really made the cake look like realistic! The full recipe is below, and I’ve put together a little photo tutorial showing how it was done. Please excuse the uneven lighting, these were (sadly) taken in the middle of the night. Maybe one day I’ll figure out the secret to making birthday cakes in advance and sleeping like a normal person. One thing you might notice in the pictures is that the cake is not actually nine layers stacked on top of each other. Rather, I made three 3-layer cakes (each cake is 9″) and put them on individual cake boards, then stacked the cakes on top of each other using dowels for support–much the way you would stack a regular tiered cake. I wanted my cake to be really tall and visually striking, but I also wanted to be able to serve people reasonable portions, so this seemed like the easiest way to get the look I wanted without having to serve small children a heart attack on a plate. The cake was a huge hit at the party. Several people asked me if it was really a cake, and I know there were a few children who were concerned that Asher didn’t have a cake at all! (I guess it blended well with the rest of the decor!) 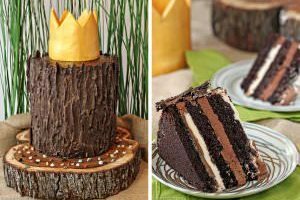 I served it on a giant 16″ tree slab, scattered with chocolate rocks, and set it on a burlap runner backed with green grass–all of the natural elements really made the gold crown pop. Sadly, this is the best picture I have of Asher with the cake. He wasn’t feeling well for his party (more on this in the next post!) and didn’t even want a slice of his own cake. He also didn’t enjoy having everyone sing–this is him crying on my shoulder during Happy Birthday. Like I said: heartbreaking. Fortunately, no one else objected to having cake, and most of it was demolished during the party. We had over 50 people, about half of them children, and I’d say we served about 75% of the cake. The remaining 25% we sent home with friends, and a few stray pieces came home with me (for photography purposes, of course!). Having the cake boards in between the layers was a godsend in dishing it up, and it was easy to cut small slices right off the top of the cake. The sides did get messy, though, and I generally had to pull the chocolate off because it didn’t cut cleanly into slices. So I was left with a lot of chocolate scraps, although people did come up and munch on it as I was dishing up the slices. And here’s what it looks like on the inside! The cake itself is my go-to chocolate cake recipe. 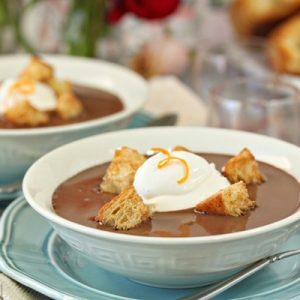 It’s moist, with a deep chocolate flavor, but also holds up well to stacking and layering. I spread a thin layer of salted caramel on the bottom layer, then topped that with salted caramel buttercream. The second frosting layer is a chocolate buttercream, which was also used around the outside of the cake. I wasn’t sure how well the salted caramel would do as a layer (whether it would cut cleanly, whether it would hold its shape, etc) so I was reluctant to use too much of it. In retrospect, it was one of my favorite parts of the cake, and I wish I’d used it for both filling layers instead of just one. I wrote the recipe with this change in mind–more salted caramel is never a bad thing! The recipe down below is for making one 9-inch cake. I figure most people probably won’t have many occasions to make cake for 50 people, but there are plenty of occasions where a 9-inch cake could come in handy! So you can recreate our Wild Things cake at home any time, but if you need to make a giant one like I did, you’ll need to triple this recipe. I’ll be back soon with all the party details, and gratuitous cute pictures of my kid. Sorry not sorry! This Where the Wild Things Are Birthday Cake is perfect for the wild things in your life. 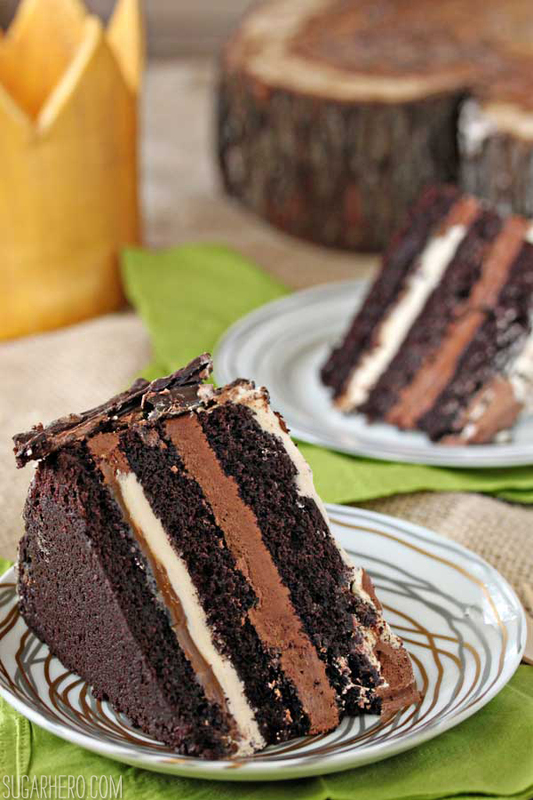 The chocolate cake and salted caramel buttercream make the perfect celebration cake. The chocolate tree bark texture is an easy technique that looks super realistic and also tastes super delicious. Line a 9x3-inch cake pan with parchment, and spray it with nonstick cooking spray. If you don't have a 9x3 inch pan, three shorter 9-inch pans can be used. Preheat the oven to 350 F.
When the dry ingredients are nearly incorporated, stop the mixer. Scrape down the bottom and sides of the bowl with a rubber spatula, and finish mixing the cake by hand. Pour the batter into the prepared pan and smooth it into an even layer. Bake the cake for 55-60 minutes, until a toothpick inserted into the center comes out with just a few moist crumbs attached. Cool the cake completely before using. The cake can be made several days in advance and kept, well-wrapped and refrigerated or frozen, until ready to use. If you freeze it, make sure it's partially defrosted before you use it so you can cut it easily. Combine the butter, brown sugar, corn syrup, sweetened condensed milk, and cream in a medium saucepan over medium heat. Stir while the butter and sugar melts. Once the mixture comes to a boil, insert a candy thermometer. Continue to cook, stirring frequently to keep the caramel from scorching, until it reads 236 F on the candy thermometer. 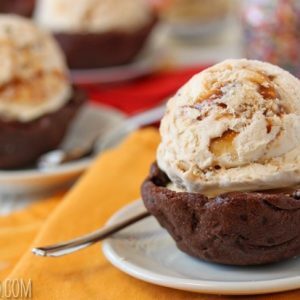 Remove from heat, stir in the vanilla and salt, and quickly pour it into another bowl to stop the caramel from cooking. Press a layer of cling wrap on top, and refrigerate it until thickened and chilled. Salted Caramel Filling can be made several weeks ahead of time and kept in the refrigerator until ready to use. Note that this recipe makes a little more than you will need, and you will probably have some filling left over. It keeps in the refrigerator for several weeks, and is great on toast or ice cream. Beat the whites on medium-high speed until they are no longer warm to the touch—feel the outside of the bowl, and make sure that it is around room temperature. Depending on your mixer and the temperature of your environment, this may take 15-20 minutes, or more. Reduce the speed to medium-low and add the softened but cool butter in small chunks, a tablespoon at a time, making sure to wait in between additions. It may separate or look a little gloopy at this point—fear not. Once all of the butter is added, increase the speed again and whip until it comes together and is light and fluffy. If, after 5 minutes, it hasn’t come together, refrigerate the mixing bowl for 5-7 minutes, to cool the mixture down, and whip it again. Add the salt. Divide the mixture in half, and to one half, add the caramel sauce, mixing until it is well-blended. Melt the chocolate in the microwave in 30-second intervals, and cool to room temperature. Add the chocolate to the remaining half of the buttercream and mix it in. The buttercreams can be made in advance and kept at room temperature if you’re going to use them the same day, or refrigerated. If they have been chilled, let them sit at room temperature until soft, then re-whip them to get the fluffy texture back before you use them. First, make the chocolate curls. Melt 8 oz of the chocolate candy coating in the microwave, stirring after every 30 seconds to prevent overheating. Pour the melted chocolate out onto a large sheet of parchment, and spread it into a thin layer. Place another sheet of parchment on top, and smooth it out with your hands. Working from the long end, roll the parchment up into a cylinder, and secure it with a rubber band. Refrigerate it until the chocolate coating has set completely. Once set, unroll the parchment—the chocolate will shatter into curled shards as you unroll it. Using a large serrated knife, cut the cake into three even layers. Place one layer face-up on a cake cardboard. Scoop some salted caramel buttercream into a pastry bag fitted with a 1/2-inch round tip. Pipe a ring of buttercream all along the edge of the cake round to act as a barrier and make assembly neater. Scoop about 2/3 cup salted caramel filling into the center, and spread it in an even layer until it covers the cake and reaches the buttercream ring. Spread a layer of salted caramel buttercream on top of the caramel filling. Top the cake round with a second round, and repeat the process of piping a ring of buttercream and spreading the caramel filling on top. This time, top with a layer of chocolate buttercream instead. Add the last cake layer on top. Spread some buttercream along the sides and top of the cake in a very, very thin layer—this is just to hold the crumbs in. Refrigerate the cake until it's firm, at least 45 minutes. Once firm, go back and add another thick layer of buttercream on the outside of the cake. It doesn't matter if you use chocolate buttercream, caramel buttercream, or a mixture of both, and it doesn't matter if it's perfectly smooth—it will all be covered in the end anyhow. Press your chocolate shards into the sides of the cake, letting the top shards extend a little ways past the top. They should be close to each other, but the occasional small space between chocolate curls is fine. Once the chocolate is applied, refrigerate the cake again to firm up the buttercream and chocolate. Melt the remaining 8 oz of chocolate coating in the microwave. 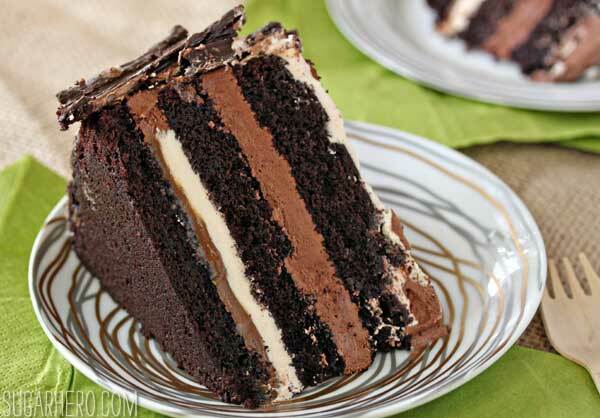 Use a pastry brush to brush the melted chocolate onto the sides of the cake. Cover every surface liberally, and don't be afraid to go back and add a second layer if it looks thin in spots. Once the sides are covered, pour a small amount of chocolate on top of the cake and spread it to the edges, so all of the buttercream is covered. Refrigerate the cake to set the chocolate completely. 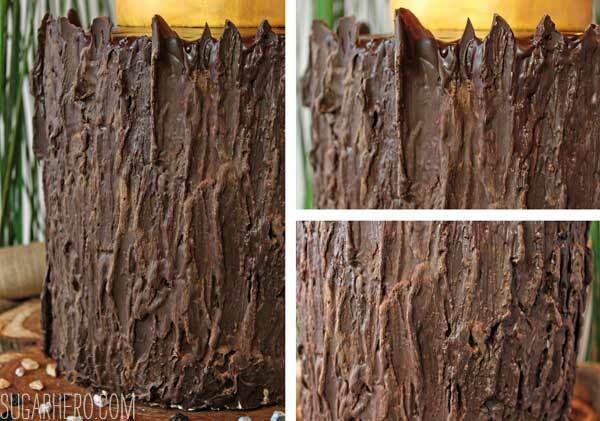 Finally, brush some cocoa powder in random spots on the sides of the cake to give it the look of dusty tree bark. Your cake is finished! Store it in the refrigerator, but for the best taste and texture, allow it to come to room temperature before serving. To make the cake shown in the pictures, you will need to triple the quantities here, except the salted caramel recipe—that can be doubled. Assemble each cake separately on its own cake cardboard, and chill them well before you stack them. When you stack them on top of each other, use large boba tea straws or big dowels to separate each layer: place one in the center of cake, and four in a ring around it a few inches from the edge. Cut the straws or dowels so that they are flush with the top of the frosted cake, then stack them one on top of each other, and decorate as described in the recipe. The chocolate cake recipe is adapted from Ina Garten’s Barefoot Contessa at Home. The Salted Caramel Filling is from Cake Central. I am making a 3 tier wedding cake using your method! I just found this today.. the cakes are all ready in the freezer. I am going to make a practice one so I can see how it will work and how long it takes. THANK YOU FOR YOUR BRILLIANCE!! I am also going to make a sample of white chocolate tinted grey to look like pine bark.!! Soooooo excited!! That’s wonderful…I would love to see pictures of the final product–PLEASE send one along! Best of luck and thanks for the comment! I first have to say this is by far the best (cutest) cake I have ever seen!! Oh no! It’s most likely the texture of the chocolate as opposed to the brush size. I used Mercken’s chocolate candy coating, which is fairly thin and fluid when melted. If you were using thicker melted chocolate (especially chocolate chips!) then you would lose some of the great texture that thinner chocolate provides. I would try thinning out the chocolate with coconut oil or shortening and see if that isn’t more successful for you. Good luck! Any tips on runny buttercream? I followed the direction (tripled), but the buttercream isn’t thickening up. Also feel free to send me an email with more details, I’d be happy to help you troubleshoot! I’m obsessed with this cake! Let’s test out my skills to recreate this beauty. I’m curious, how did you make the crown?! Thanks Mary! I’d love to see pics if you give it a try! To make the fondant crown, I first made a paper crown to use as a template, to be sure that all of the spikes on top were evenly spaced etc. 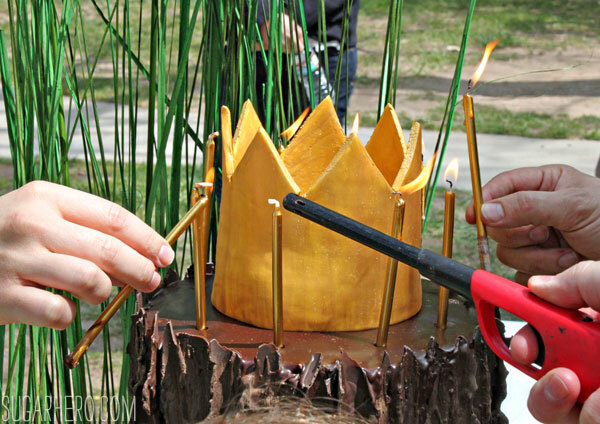 I wrapped a tall cake pan (I think a 6×3″) in waxed paper and used that to determine the circumference of the paper crown. Your exact size will vary of course. 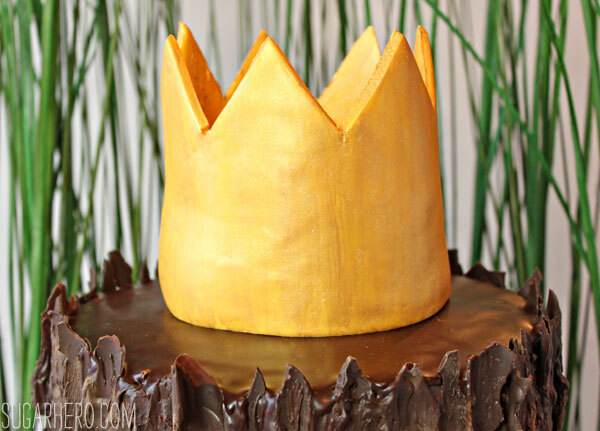 Once I had my paper crown, I rolled out deep yellow fondant to be about 1/4-inch thick. I used the paper crown as a template and cut out the crown shape from the fondant, then I let it sit at room temp to stiffen up. I don’t remember the exact time, maybe 20-30 minutes? It will probably depend on the texture of your fondant and how thick it is. I would probably start checking it after 10 minutes and just try lifting the crown up, seeing how floppy it is, etc. You want to hit that sweet spot where it’s still moldable and won’t crack when you bend it, but is starting to stiffen up and the spikes will hold their shape. So yeah, leaving it to sit at room temp for awhile before bringing it vertical is the key. Then I took that same waxed paper-covered cake pan and dusted the paper with a little powdered sugar, and wrapped the fondant crown around the pan, to give it shape and substance and make sure it’s perfectly circular. I glued the ends together with tylose glue, but corn syrup or water would probably also work. Then I let it sit for a couple of days. When it was really firm, I lifted the crown off of the cake pan, and the waxed paper made that really easy to do. Brushed the outside with gold luster dust, and it was done! Thank you so much for the great recipe! On the salted caramel filling, when I pulled the filling out after being in the fridge overnight it seems very solid. Do I need to warm it before mixing or adding to the layer in the cake? Or, do you think I possibly cooked it too much? It has great flavor and you can eat it, but it’s definitely not pourable. Thank you! Hi Jessica, so sorry for the belated reply. If it’s very solid, then it’s possible it’s been cooked a little too much. It’s an easy fix, though–just put it in a microwave-safe bowl, and add a spoonful or two of water/milk/cream (and of them will work) and heat and stir. Let it cool to room temp and then use it. Adding just a bit of extra liquid will soften the caramel right up! Good Morning Elizabeth! I am going to attempt to make your wonderful cake and am wondering if I can decorate the entire cake the day before? 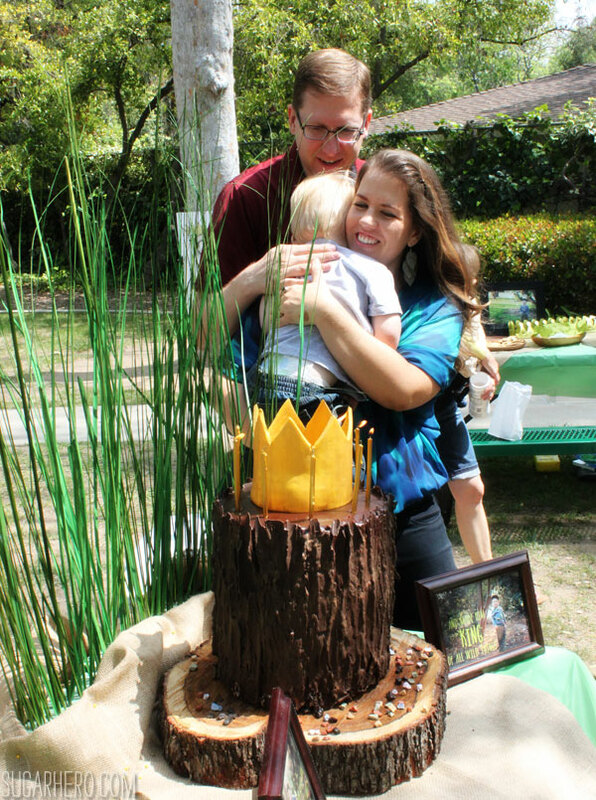 Thanks so much for this post, I made this cake over the weekend for my little man’s Lumberjack themed 1st Birthday Party and people couldn’t believe how much it looked like an actual tree…it turned out even better than I could have imagined! Hi… I just made this cake and it came out great, people really like the chocolate cake. I was wondering if you had a similar recipe for a vanilla cake? Thanks! Do you know if this cake recipe tolerates the reverse creaming method? Hi Holly, I haven’t tried it, so unfortunately I can’t say one way or another. Beautiful! How would you transport a cakelike this? How did you make the crown? I ended up making this cake recipe for my boyfriend’s surprise 40th birthday party recently and it was Amazing! It tasted fantastic and looked beautiful. Everyone thought I had bought it from a professional bakery. I did a few less layers and did end up screwing up the caramel sauce. But I was able to improvise a bit. I think I need to invest in a candy thermometer and try the caramel again.This recipe is getting used again. Thanks! Can I use any chocolate for the bark? I’m thinking just the bakers chocolate bars thstvyou get in the baking aisle of any supermarket since I’m in a time crunch. I’m making this cake decoration for a party this next weekend. You’re incredibly talented! If mine turned out 1/2 as good as yours I’ll be thankful. Hi! I’m so excited to make this cake for my sin’s birthday next weekend! I have a quick question–are the salted caramel sauce and salted caramel filling two different things? One that you buy and one that you make? It looks that way but I just want to make sure, thanks!? I just wanted to thank you for the bark idea. I was going to use a different method to get the bark effect on my cake but things weren’t working out. So I switched to the idea you showed in this post. I ran out of time so I wasn’t able to do more than adhere the chocolate curls to the ganache but it still looked convincing and I got a bunch of compliments. The couple I made it for as a surprise really liked it, too, which was all I was trying for. So, thank you!! Aw awesome!! I’m so glad it went well for you! And any time, I love coming up with new cake ideas! I’d love to see what you do in the future! Hi! This sounds so cute! The only problem I can think of as far as freezing it with the bark on is that the chocolate will have condensation on it as it defrosts from the freezer. You can try and minimize that by wrapping it in plastic wrap before freezing, and letting it sit in the plastic wrap as it comes to room temp (this will help avoid harsh temperature changes), and if you’re going to dust the outside of the chocolate with cocoa powder at the end to finish it off, some condensation marks probably won’t matter anyhow. But if you want to keep more of a shiny chocolate appearance, I would recommend adding the chocolate after the freezing process, because there’s no way for it to freeze + defrost and still keep the pretty chocolate shine. Let me know how it goes! Hi Elizabeth, I love the chocolate bark idea! 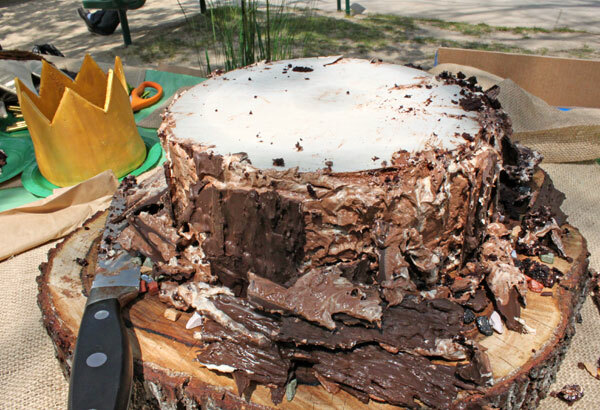 Finally I could make a realistic tree stump cake without fondant. I just made one, it was so simple and there weren’t many dishes as I only needed 2 bowls and parchment paper, but the result was WOW! It was a bit messy as the chocolate kept melting in my hands (i tried using gloves but it was so hard to attach the chocolate bark to the cake) and it kept drying out on my brush, but it definitely beats having to roll out fondant and colour it etc. Did you ever have any problem with chocolate drying out very fast? I used merckens candy melts. Thank you!! I’m so glad you liked it! That’s what I used too, and I didn’t have a problem with it, but you could try putting the bowl of melted chocolate coating over a saucepan the warm water or on a very low heating pad. This should keep it warm for longer. Let me know if this helps!! Thank you for this amazing idea of the chocolate bark. Have been looking for something other than fondant for a family wedding cake in December. Have just had a trial run and found it so easy and realistic. Definitely a keeper. Thank you so much! I’m glad you enjoyed it! I wish you and your grandson a happy birthday! We made this for a December 17th Birthday. It was so very easy to put the “bark” on the cake. Thanks for sharing!! Thank you for the wonderful inspiriarion. I used your recipe for my daughters Tinkerbell themed birthday. I had such fun making the cake and it turned out to be totally delicious! LOVE the method for creating the bark! I’m doing a demo with my 6 year old daughter this spring at our local cake show and was planning to show some decorating techniques that are “kid friendly.” Could I have permission to show this technique? Just made this cake for my son’s first birthday last weekend. We also did Where the Wild Things are. The cake was super delicious and looked amazing! Everyone was impressed and I’m glad I was ambitious enough to try it. Just made this for my sons birthday. Thank you for the great detailed instructions it was a huge hit!!! Julie, I’m thrilled to hear that! Thanks for the feedback, and happy birthday to your son! Hey I love this I want to make it for my sons 1st bday on Sunday! Can you explain the straw thing a little more. Im unsure of how to set that up. Hi Elizabeth, thank you for this amazing recipe, I will try to make it in a couple of days for my son’s first birthday. Egg whites are safe to eat as long as they are cooked 170 degrees Fahrenheit, so if you are concerned, you can use a food thermometer. Otherwise, I think the real pleasure of the cake is the decorations, so you can swap out the frosting for another of your choice and it should still be charming! Good luck and I hope it turns out beautifully! 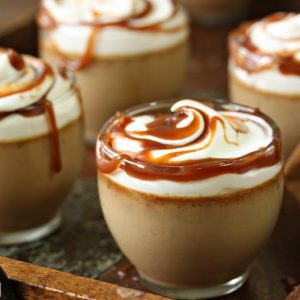 The caramel sauce in buttercream is different than the caramel you make for filling? I just wanted to let you know I made these cakes (with a few variations) and they were seriously a huge hit for my nephews 1st birthday party. I was too nervous to ‘paint’ the chocolate on after putting the shards of chocolate on the cake because I was assembling this the morning Of the party but I will definitely give that a go in the future. The shards still gave it a super cool ‘forest/tree’ effect. Hello! I was just wondering if the chocolate bark would work with any kind of frosting other than buttercream? Hey Jess, yes it should work well with other frostings. It just needs to adhere to it, so as long as it isn’t too cold or crusted over it should work! Thanks! Hi! I was just wondering if the bark would work with a frosting other than buttercream. Hi Elizabeth! I was wondering if using 3 shorter 9” pans would require a shorter bake time? Hey Stephanie, yes it will be a shorter time. My suggestion would be to start checking it 10 minutes earlier and keep an eye on it. Thanks so much! Hi there, can’t wait to try this for my friend’s baby shower this weekend. What is your advice on making in advance? I was thinking of making the cake and the frosting the day before, wrapping the layers, and leaving it room temp. Then rewhipping the buttercream and assembling the day of the party. What are your thoughts? Hey Tory, making the stuff in advance sounds great I would recommend putting the cakes in the freezer and then letting them partially defrost before assemble. Good luck that’s so fun! Let me know how it goes, Thank you!